Photo courtesy of Jean Potter Double-crested cormorants are quite at home in the water, where they hunt for fish using their hooked bills. In the waning days of summer and these early days of fall, I’ve been seeing a welcome diversity of birds, including warblers, flycatchers, tanagers and even some unusual waterfowl. 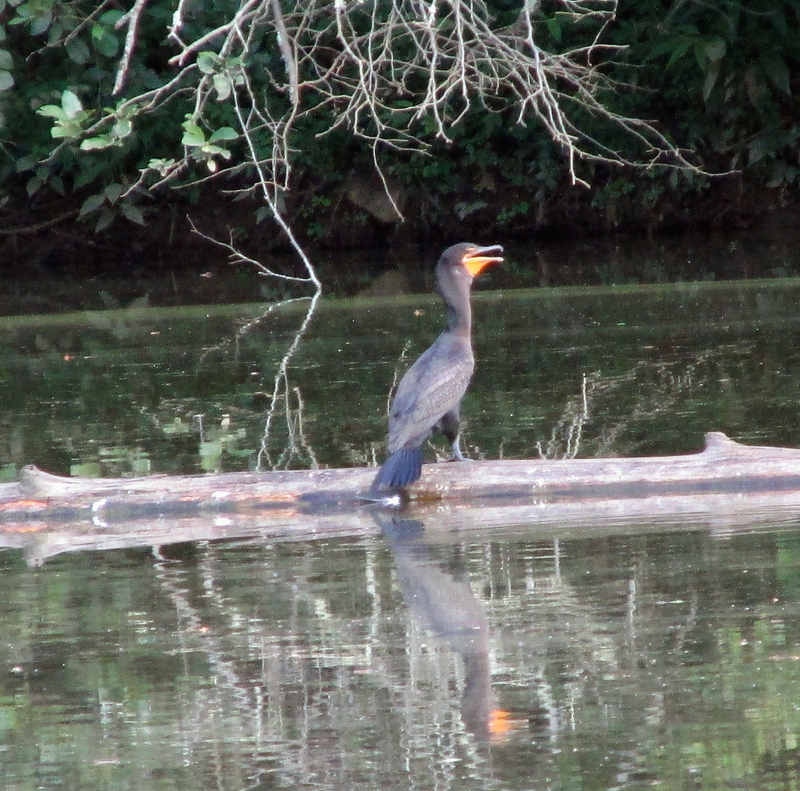 The ponds along the linear walking trails in Erwin are good locations for seeking migrating double-crested cormorants. These large, fish-eating birds also show up occasionally at the large pond at Erwin Fishery Park. Some people mistake these aquatic birds for anhingas, or “snake birds,” which are named for their habits of swimming with only their necks and heads above the surface of the water. The anhinga, a bird of southern wetlands and swamps, is not all that closely related to cormorants. These two species merely share a superficial appearance, differing mostly in the shape of their bills. Cormorants have a serrated, hooked bill good for grasping slippery fish while anhingas have a sharp bill similar to a herons that is useful for spearing fish. Photo by Bryan Stevens A Double-crested Cormorant perches on a fallen log in a pond. The double-crested cormorant is widely distributed across North America, ranging from the Aleutian Islands in Alaska down to Florida and Mexico. These fish-eating birds are also abundant on inland lakes across the United States. The double-crested cormorant can reach a body length of almost three feet and is a dark bird. Adults have black plumage, but young birds are brownish or gray in coloration. The bird gets its common name from the double crest of black and white feathers displayed during the breeding season. Photo Courtesy of Jean Potter The double-crested cormorant is a fish-eating bird perfectly adapted to its aquatic lifestyle. Cormorants lead a mostly aquatic lifestyle. Unlike many types of waterfowl, such as ducks and geese, cormorants do not have waterproof feathers. 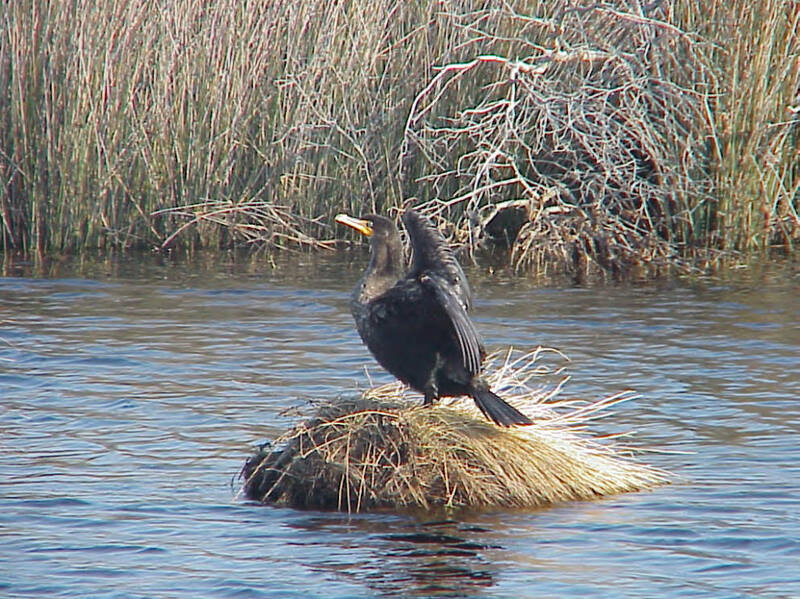 After a dive into the water for a fish, all cormorants have to spend time out of the water to dry their feathers. Fish compose the majority of a cormorant’s diet, but these birds may also take an occasional amphibian or crustacean. While the double-crested cormorant can be found on local lakes and rivers at almost any time of the year, these birds are most often encountered during migration in the spring and fall. In recent years, instances of nesting have been increasing in the area. 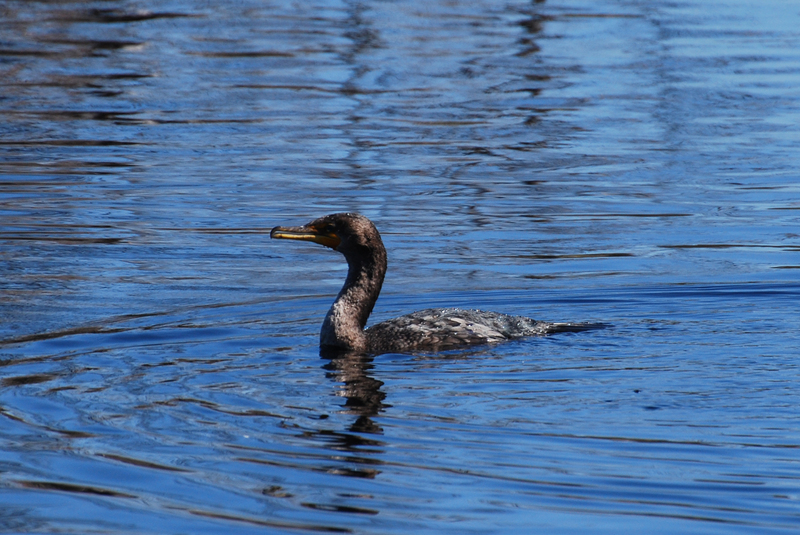 I have even observed double-crested cormorants at large ponds and small lakes at city parks. Photo by U.S. Fish & Wildlife Service A double-crested cormorant takes time to dry its feathers after spending time in the water searching for fish. Worldwide, there are about 40 different species of cormorants, which are also known by the common name “shag,” which refers to the crest of feathers evident on many of these waterfowl. Experts have not had an easy time defining relatives of the cormorants. Many experts include gannets, anhingas, pelicans and even penguins as possible close relatives of the cormorants. The flightless cormorant, also known as the Galapagos cormorant, is native to the Galapagos Islands. It is a unique member of the cormorant family in that it is the only one that has lost the ability to fly. Other species of cormorants include spectacled cormorant, reed cormorant, white-breasted cormorant, king shag, red-footed shag, crowned cormorant and pygmy cormorant. 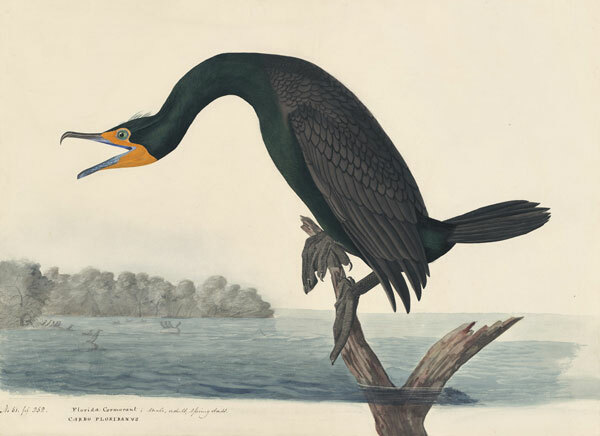 Early naturalist and artist John James Audubon painted this double-crested cormorant. North America is home to a few other species of cormorants, but none are as widespread as the double-crested cormorant. Others include the great cormorant, pelagic cormorant, Brandt’s cormorant, red-faced Cormorant and the Neotropic cormorant, which is found along the southeast areas of Texas down into Mexico. 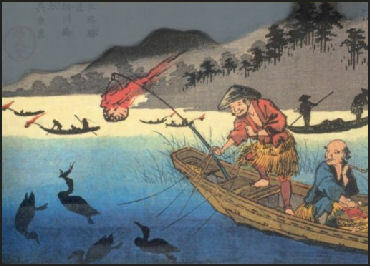 A painting of humans using cormorants to catch fish. In some parts of the world — Japan, China and Macedonia — humans have trained cormorants to capture fish for them. A cord or ring around the cormorant’s neck prevents the bird from swallowing anything other than small fish. Larger specimens captured by the cormorants are retrieved by the human angler. In Japan, fishing with cormorants is a tradition dating back 1,300 years. Even today, Japanese cormorant fishermen are important as a tourist attraction. Elsewhere, fishing with cormorants has become less common as more modern means of catching fish have become readily available. 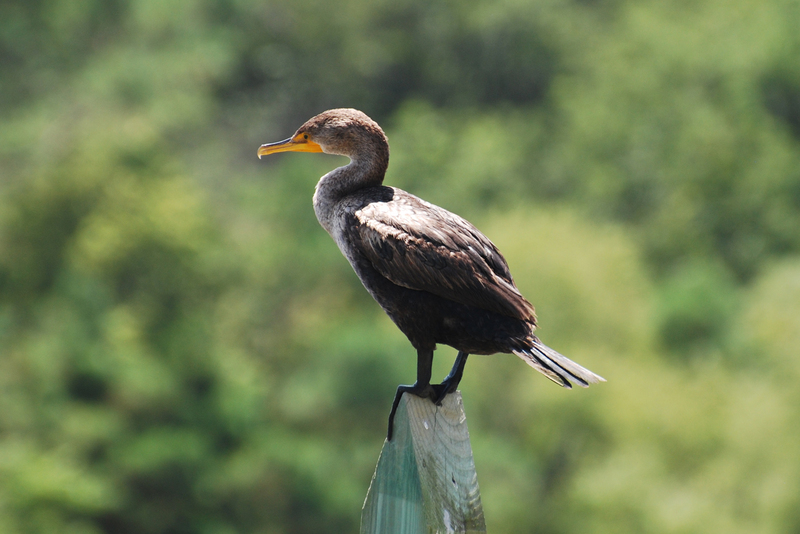 I don’t expect we will see people using cormorants to catch fish from Holston Lake, but you can probably visit the lake with at least a likelihood of seeing these unusual birds catch fish for their own consumption. This entry was posted in Birding, Birds, Cormorants, Double-crested cormorant and tagged Birding, birds, Bristol Herald Courier, Carter County Compass, Cormorant, Cormorants, Double-crested cormorant, Elizabethton Star, Erwin Record, Feathered Friends, McDowell News, Our Fine Feathered Friends, The Erwin Record on October 4, 2015 by Bryan Stevens.